Okay, so that’s our public-opinion baseline on the economic status quo. People are hurting, they’re fearful about the future, and they think the system is rigged against them. Indeed, we can instantly see that the percentage of the public that feels angry about the way things are going exceeds the percentage of the public supporting either presidential candidate, or either party. In other words, with the right message, a populist candidate, or party, has room to grow. To put these findings another way, there’s a large group of Americans—at least 60 percent, and probably more—that is fearful and angry, yet at the same time, stubbornly hopeful about their country. In the past, in the late 1960s, this group was called the Silent Majority — that is, the law-abiding citizens who believed in, and lived by, the tenets of the American Dream, and yet felt taken advantage of by others, mostly on the left. After Richard Nixon’s 60.7 percent national landslide in 1972, this majority was proven to be a formidable ballot-box winner. To be sure, times change. And so today, that massive body of opinion is partially latent, having been neglected by the political class. Yet that 60 percent majority is still there. Potentially, it’s the basis of a populist-nationalist coalition that would be larger than the followings of any of the current candidates or parties. Thus the challenge is to convert potentiality into actuality. As we think about mobilizing this majority, we might first reach for the political tools needed to develop it. Obviously, the news itself is once such tool. After all, an informed public is an aroused public—and there are plenty of outrageous developments to get fired up about. As they say, it’s a target-rich environment. So perhaps we could start by considering just six recent items in the news, dividing these half-dozen items into three pairs of two each. As we shall see, the first pair is about economic hard times—unemployment and under-employment. Next, the second pair provides details as to how the rich are rigging the tax system—that is, by not paying their taxes. And finally, the third pair is about the populist backlash against this abuse—and then the elite backlash against the populists. After that, in Part Two, we’ll consider some possible solutions. Oh, but first, one key thing: As you’re reading the following six news items, please keep these test-questions in mind: What would the average American think? What would be the gut reaction of folks to this news as they sit around a kitchen table? And if you think that John or Jane Doe’s reaction would be about the same as yours, then maybe you’ll see what I’m seeing: The potential coalition for a center-right commonsense coalition is a lot larger than most Republican “strategists” realize. That’s the real point here: This six-pack of items is nothing but a tool for threshing out the voters in a new way. Threshing them out, that is, to help outline a larger vision of the populist-nationalist coalition that’s waiting to be realized—if only we’ll realize it. Look at the fraction of American men age 20 and older without paid work. In the past 50 years it rose to 32% from 19%, and not mainly because of population aging. For prime working-age men, the jobless rate jumped to 15% from 6%. So yes, we need to get people into work, because work organizes life, as well as grows the economy. Or, on the other hand, we could do nothing: If we want more crime and chaos, all we have to do is hold to the same course we’re on now. No doubt many Mother Jones readers were upset over Hochschild’s knowing exposition of how and what workers actually think, as opposed to the usual condescension that writers at MoJo normally enjoy heaping upon them. Third, Edward Luttwak, a longtime scholar at another right-leaning think-tank, the Center for Strategic and International Studies, published a piece in the August 17 edition of the London-based Times Literary Supplement entitled, “Hidden Assets, Hidden Costs.” Luttwak reviewed a new book by two German journalists, The Panama Papers: Breaking the Story of How the Rich and Powerful Hide Their Money. The Panama Papers, of course, are the documents leaked from the Panamanian law firm of Mossack Fonseca, which has set up an astonishing 214,000 “nameplate” corporations around the world, mostly as tax shelters in such tax havens as the Grand Caymans. These shell shelters in their hideaways have played host to trillions of dollars—maybe even tens of trillions—in private wealth. So if you’ve ever wondered how the “one percent” has managed to stay on top in the face of the progressive income tax, well, the answer is easy: Only rarely does the one percent actually pay anything more than a token amount of income tax. It’s easy to beat the tax man if you never see him—and if he never sees you. Of course, the one percent has plenty of help in its tax-dodgery. One might even say, “It takes a village”—a village, that is, of lawyers, accountants, lobbyists, and political fixers. Moreover, as Luttwak incisively observes, the one precent get even more help: They also enjoy the assistance of politicians, journalists, as well as other kinds of courtiers. These solicitous assistants are found all over the world’s political capitals, of course, where they fight to make sure that wealth is well-protected. In addition, these apparatchiks can be seen thronging to elite gathering places for “thought-leaders,” such as the World Economic Forum at Davos, Switzerland, and the Aspen Ideas Festival. A case in point is the Obama administration. Brimming as it is with PC thinkers, it hasn’t done anything, in almost eight years, to clamp down on systemic international tax avoidance—even evasion. After all, today’s avoider/evader is possible also a donor to the Democrats, and maybe a future employer for Obama alumni. Thus it should be little surprise that the effective tax rate on the 400 top earners in America has fallen by a third in the last three decades, to just 17 percent today. Every Viennese cafe, every sausage stand pays more tax in Austria than a multinational corporation. . . . That goes for Starbucks, Amazon and other companies. Of course, the same comparison could be made within America itself: The hardware store down the street is likely paying a higher tax rate than many giant multinationals. And the same holds true, come to think of it, for most of the hardware store’s customers. We might pause to observe that the Obama administration has been working with extraordinary diligence on behalf of one mega-company, Apple. You see, the European Union (EU) finally noticed that Apple was paying a mere .005 percent tax rate in Ireland, an EU member. Moreover, not surprisingly, Apple had cleverly managed to shift, over the years, most of its mammoth profits away from higher-tax countries, preferring to park most of its earnings in that emerald-green island of shamrocks and shelters. We might stipulate that .005 percent is not a typo: To put that itty-bitty percentage in perspective, it’s a mere nickel of tax—that is, five cents—for every thousand dollars of income. And yet the Obama administration, that purported paragon of progressivity, thinks that rate is just dandy. Dandy, that is, for Apple, if not for you and me. In fact, just two weeks ago, on August 24, the Treasury Department published a 25-page memorandum defending Apple’s right to beat the taxman, worldwide. In the meantime, we among the unwashed masses—including domestic small businesses, most of which pay at or near the statutory US corporate rate of 35 percent—are left to wonder: If any of us, who aren’t big donors to the Democrats and to Hillary Clinton—as is Apple’s CEO, Tim Cook—decided that we wanted to pay a .005 percent tax rate, would the Obamans similarly have our back? The failure—a profound one—lies in not ensuring that gains were more equally shared, notably within high-income economies. Equally dismal was the failure to cushion those adversely affected. Continuing in that vein, Wolf, who himself mostly supports more trade, added, “Pushing globalisation forward requires different domestic and external policies from those of the past.” That is, the rich will have to learn to be more mindful of the impact of their policies—and maybe even learn to share. As we shall see in Part Two, such sharing isn’t actually so bad—in fact, it can be good for business. However, that’s not how the elite see things, at least not yet. Meanwhile, in the conclusion of his piece, Wolf considered the possibility of true reform; then he asked and answered his own question: “Will that happen? Alas, I am not optimistic.” In other words, absent sincere reform, the backlash from below will continue. Sixth, also on September 6, Bridget Johnson of PJ Media headlined her piece, “UN Commissioner Warns of ‘Weaponized’ Populism from Wilders, Trump, Farage Turning ‘Into Colossal Violence.’” That would be Zeid Ra’ad al-Hussein, the United Nations’ High Commissioner for Human Rights. And if the FT’s Wolf is deemed to be a thoughtful pessimist, then al-Hussein must be deemed as a reactionary propagandist. Yes, even trendy leftists can be judged to be reactionaries—maybe they’re the most reactionary of all. The authorities restricted freedoms of expression, association and assembly, and prosecuted and imprisoned government critics. Torture and other ill-treatment continued in detention centers and prisons, and the State Security Court continued to conduct unfair trials. Admittedly, the Jordanians are trapped in a violent and fearsome geographic neighborhood; given all the threats they face, they have little choice but to be tough. So perhaps we should cut them some slack. But if so, then maybe al-Hussein, atop his cushy UN perch, should be cutting us some slack. Yet instead, wandering far from his ancestral palace in Amman, al-Hussein enjoys the luxe lifestyle of a “worldcrat,” all the while devoting himself to criticizing the West. Haven’t we had enough of that hypocritical stone-throwing? And in addition to slagging Trump and Farage, al-Hussein also hammered just about everyone on the worldwide patriotic-populist-nationalist right, including France’s Marine LePen, Austria’s Norbert Hofer, and Holland’s Geert Wilders. Indeed, the UN’s Al Hussein even attacked the incumbent prime minister of a UN member state, namely, Hungary’s Viktor Orban. In its mode of communication, its use of half-truths and oversimplification, the propaganda of Da’esh [ISIS] uses tactics similar to those of the populists. So there you have it: When the masses dare to speak up for themselves, the elites slap them down as being little different from terrorists. Okay, we’re all done with our six items, fresh pickings from the ever- overflowing news-basket. We have seen, first, that times are hard; second, that the one percent are playing their own short-sighted game of separate-but-unequal; and third, that the resulting populism from below is crashing headlong into the elitism from above. Now if I may beg the reader’s indulgence, let’s please revisit the test-questions mentioned at the beginning of this article. They were, What would the average American think? What would be the gut reaction of folks to this news as they sit around a kitchen table? If you think, as I do, that at least 60 percent of Americans believe that yes, people should be working, that yes, the rich should pay their fair share, and that yes, the global elites should be respectful of patriotic values, then we’re getting somewhere. That is, we’re starting to envision that 60 percent majority. After all, it’s readily apparent that our 60 percent are not basing their views on ideology but, rather, on common sense. Still, it can be mobilized, 60 percent is a big number—a winning number. That is, a candidate or a party can win a lot of elections with 60 percent of the vote. Indeed, with 60 percent on one’s side, the victor claims a major mandate for genuine change. So we could think of these six news items as a kind of screening tool for the building of a coalition—a big coalition. If, in fact, 60 percent of Americans have the same basic reaction to each item, then we’re on our way towards developing that center-right commonsense coalition. And of course, to do the screening, one needn’t use these particular news items; one can pick any six items—or sixty—that one might wish. The only suggested rule for would-be coalition-builders is this: The reactions to each item must yield up at least a 60 percent center-right majority. Anything less, or much less, and it’s just the same old fighting, the same old stalemate. Yes, stalemated fighting may sometimes be necessary, but it’s not the same as coalition-building—and winning. So a quick bit of advice , if I may, to all would-be center-right test-administrators: If a possible news item includes praise for certain individuals and concepts, including, for example, “Glenn Beck,” “Friedrich Hayek,” “gold standard,” or “spreading democracy around the world,” then the answers received will probably not add up to the requisite 60 percent—or at least not 60 percent on the side of the hoped-for center-right coalition. To put the matter another way, one will likely achieve better results by focusing on other issues offering more upside, such as, for example, “jobs,” “anti-terrorism,” “personal safety,” and, of course, “patriotism”—those are all 60 percenters—at least. Yet in the meantime, we might ask a more immediate question: In the here and now, what do we think will be the impact of this latest batch of news, the six items cited above? And we must say, with regret, that the answer will likely be, not much. That is, activated populists and nationalists, of the sort who read Breitbart, who are already alert and energized, will become even more alert and energized—if that’s possible. Yet at the same time, the global elitists, already smug, will stay just as smug—they couldn’t get any smugger. Indeed, with every new attack, they simply hire more p.r. flacks and thicken their skins with more layers of defensive self-righteousness. Meanwhile, most other folks—the remainder of that commonsensical 60 percent, but not yet activated—will just shrug their shoulders as they hear the news and move on. So now we can ask: What happens when the irresistible force of populism collides with the immovable force of elitism? We can’t really know the answer, of course, but most likely, the result, at least in the short term, will not be pretty. After all, history tells us that the end-result of endless cycles of unreconciled bitterness and division is violence—even civil war. So for the sake of those of us who instinctively prefer political evolution to violent revolution, it’s worth exploring whether we can find some effective answers to our troubles. And in fact, our own history provides us with hope. That is, here in the US, we’ve been down this road before—and come away from the journey even stronger. Sometimes, of course, as with the US Civil War, bitter political divisions have ended in massive tragedy, even if the long-term outcome was positive. Yet at other times, deep political divisions were resolved mostly amicably—a far better outcome. As we shall see, strong and far-seeing leadership can make all the difference. More than a hundred years ago, at the turn of the 20th century, America faced a crisis that was, in many ways, similar to what we are seeing now. That is, the rich were getting richer, and many of the the rest, if not actually getting poorer, were barely scraping by. Meanwhile, massive immigration was rearranging society. Finally, in the meantime, giant corporate combines—back then, commonly referred to as “trusts”—were dominating the economic and also political landscape, piling up big profits while grinding the faces of the poor. Enter President Theodore Roosevelt. 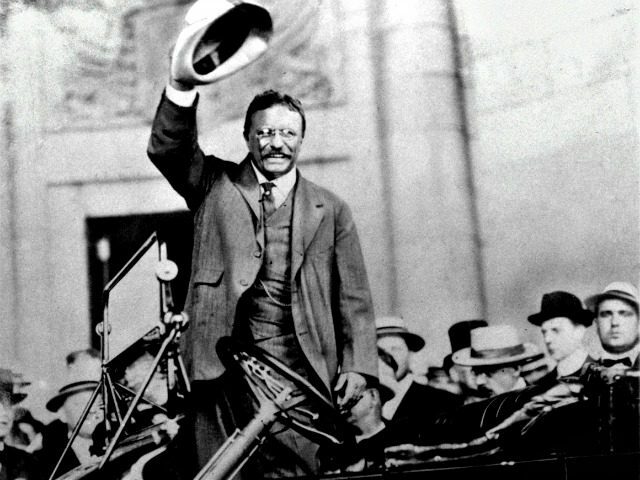 TR, born to great comfort in New York City, was easily a member of that era’s one percent, and yet he was different: He had ideas about improving the lot of all Americans—that is, the full hundred percent. Indeed, as a young man, he sojourned to North Dakota for two years, there to work as a ranch-hand; his main goal was to toughen himself up, and yet he also gained lifelong empathy for the travails of ordinary folks as they worked and struggled. So thus we can see, as president, beginning in 1901, TR had credibility with both sides of the class divide: He was one of the one percent, but he also knew the lives of the ninety-nine percent. We do not intend that this Republic shall ever fail as those republics of olden times failed, in which there finally came to be a government by classes, which resulted either in the poor plundering the rich or in the rich exploiting and in one form or another enslaving the poor; for either event means the destruction of free institutions and of individual liberty. In pursuit of those goals—ameliorating class conflict, thus saving the Constitution and the Union—TR launched an ambitious agenda of regulatory and political reform, affecting everything from the operation of the railroads, the mines, and other workplaces, to the safety of the food and drugs that Americans consumed. No wonder he was re-elected in 1904 with 61.2 percent of the two-vote. So we’re starting to see a pattern here: Develop that center-right majority; win 60 percent or more of the nationwide vote. Moreover, many other enduring reforms that TR supported and set in motion—such as an income tax, anti-trust enforcement, and the direct election of US senators—would still come later, after he had left office. From the perspective of today, in 2016, we can see that the TR presidency is still a good role model for conciliatory leadership: That is, find a leader who will implement policies so that the rich won’t continue to exploit the poor, and, at the same time, make sure that the poor don’t feel compelled to rise up and perhaps plunder the rich. To be sure, many purists, of various ideological hues, have criticized TR’s pragmatic brokering of disparate interests. And yet we’ll never know what those critics would have done instead, or how they would have fared. And why is that? Because ideological purists never get elected, that’s why. Okay, so we’ve seen the history, and theory, of the 60 percent majority; next, in Part Two, we will get specific about the problems of the here and now. Next in Part Two: Supply-Side, Meet Demand-Side: The Promise of Fusionomics.